Background: Malfunction of continuous ambulatory peritoneal dialysis (CAPD) catheters is a frequent complication and has traditionally been treated with a laparotomy. We present our experience with minimally invasive surgical (laparoscopic and thoracoscopic) salvage of CAPD catheters. Materials and Methods: Between October 2003 and June 2013, 19 patients (13 males and 6 females with a mean age of 37 years [range 28–64]) underwent minimally invasive laparoscopic salvage of malfunctioning CAPD catheters. These catheters had been placed with either a percutaneous or open technique and had been in place for a mean of 4.5 months (range 2–18 months). All the salvage procedures were performed under general anaesthesia using one 10 mm and two or three 5 mm ports. The various manoeuvres undertaken to re-establish catheter function included correct positioning the catheter and anchoring it to the pelvic peritoneum, clearing the fibrin clot/sheath, freeing up the omentum/bowel/taenia coli. In addition, all patients underwent an omentopexy. Results: Laparoscopic salvage could be completed in 18 patients with good catheter inflow and outflow established at the end of the surgery and one patient underwent thoracoscopic salvage. The median operative time was 63 min (range 45–96 min) and median post-operative hospital stay was 2 days (range 2–5 days). Low volume dialysis was commenced the day after surgery and full volume dialysis by the 10th day. There were no intra- or post-operative complications. All the catheters were functioning at the end of 6-month follow-up. Conclusions: Minimally invasive surgery is a valid, safe and efficacious way of salvaging malfunctioning CAPD catheters. This modality reduces the chances of re-formation of adhesions, ensures rapid recovery, reduced wound-related complications and allows for early institution of peritoneal dialysis. Continuous ambulatory peritoneal dialysis (CAPD) is a recommended alternative to haemodialysis (HD) for patients with end-stage renal disease. Catheter malfunction is one of the major causes of its discontinuation. Catheter outflow obstruction is responsible for 60% of malfunction., Causes of obstruction include catheter tip migration, kinking, malposition, fibrin casing, debris in lumen, omental wrapping, adhesions and encasement of catheter by various intra-abdominal organs.,,,, The non-surgical methods for rescuing a malfunctioning catheter (achievement of adequate inflow and outflow) include bowel enema, urokinase administration, forceful saline flushing of the catheter and fluoroscopy-guided manipulation with a stiff wire. Till the catheter function is restored, patients need to be shifted to temporary HD. Failure of non-surgical methods of salvage warrants removal of the catheter. Attempts at surgical salvage have traditionally been done by a laparotomy or a mini-laparotomy, both of which cause a delay in the initiation of peritoneal dialysis (PD) and likely result in re-formation of intraperitoneal adhesions. The present study reviews our experience with the use of minimally invasive surgery in the salvage of malfunctioning CAPD catheters. We retrospectively analysed data of 19 patients with malfunctioning CAPD catheter referred to the Department of Minimal Access Surgery at a tertiary care centre between October 2003 and June 2013. Nine of these patients had a prior CAPD catheter insertion done by a percutaneous method and ten through a mini-laparotomy, and in none of them, an omentectomy had been performed. All the patients had documented inflow or outflow obstruction. Patients with confirmed catheter infections were excluded from the study. After documentation of inflow or outflow obstruction, a plain abdominal X-ray was performed to check the position of the catheter tip. A chest X-ray was done in one patient who developed right-sided pleural effusion on initiation of PD. 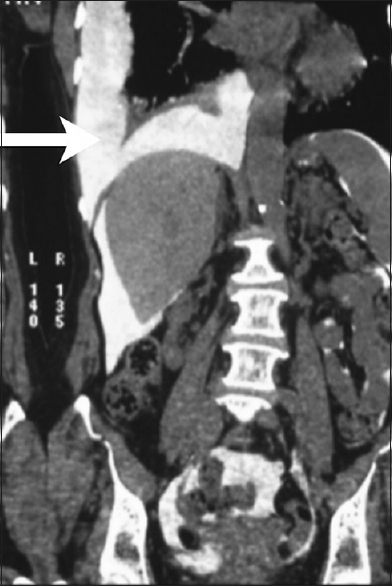 This patient also underwent a computed tomography (CT) scan with instillation of contrast through the PD catheter [Figure 1]. Non-invasive methods at catheter rescue such as bowel enema, urokinase administration, forceful saline flushing of catheter and fluoroscopy-guided manipulation with a stiff wire had been tried in nine patients. An informed consent was obtained from all patients before surgery. All the laparoscopic procedures were carried out under general endotracheal anaesthesia. A 10 mm port was established at Palmer's point (left upper quadrant) after insufflation with a Veress needle or in the midline in a supraumbilical location using an open method. Two or three other 5 mm ports were established under visual guidance. After preliminary survey of the abdominal cavity, the intraperitoneal portion of the PD catheter was identified and traced to its tip. This allowed the identification of the cause of the malfunction. The cause was remedied using an appropriate manoeuvre [Figure 2]. The tip of the catheter was anchored to the pelvic peritoneum with a non-absorbable suture. 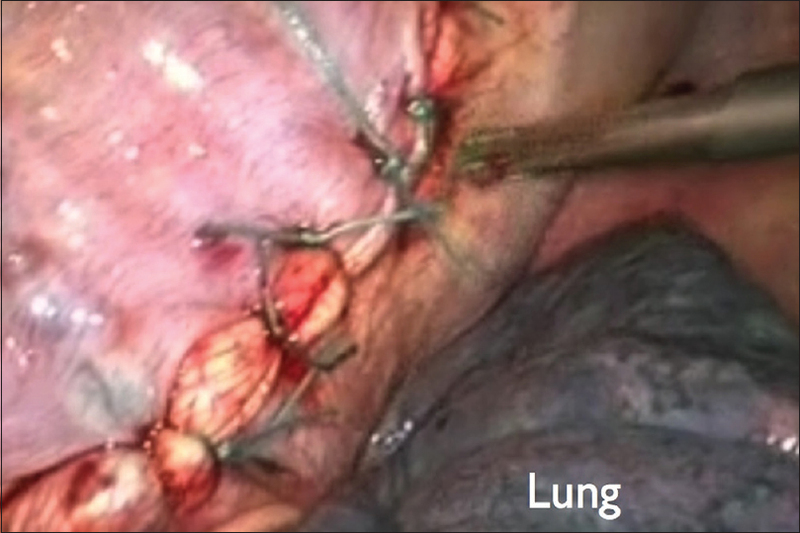 In addition, omentopexy was carried out by picking up the greater omentum at multiple places with a non-absorbable suture and retrieving the ends of the suture with the help of a suture passer/port closure device through a stab incision in the right or left upper abdomen [Figure 3]. The suture was tied over the fascia, thus anchoring the omentum in the supra-colic compartment away from the PD catheter. The fascia at the 10 mm port site was meticulously closed with non-absorbable material. One patient underwent with recurrent pleural effusion on initiating PD underwent thoracoscopic examination of the right pleural cavity under single lung anaesthesia. One 10 mm and two 5 mm thoracic ports were used. After placing the patient in a reverse Trendelenburg position, the area of the dome of the diaphragm was flooded with saline. The PD catheter was connected to a CO2 insufflator tubing, and the abdomen was insufflated to a pressure of 10 mmHg. Multiple small rents corresponding with suspected patent pleuroperitoneal communications (PPCs) were identified and these were closed with multiple placating sutures of 2-0 polyester (Ethibond, Johnson and Johnson, Mumbai, India) [Figure 4]. A mechanical and chemical pleurodesis was undertaken with 10% povidone-iodine solution and an intercostal drain was placed. All the patients were followed up at 10 days after discharge and at 3 months. The variables studied were demographic details of the patients, types and causes of catheter malfunction, manoeuvres undertaken for salvage, operative time, intra- and post-operative complications, post-surgical hospital stay and duration of catheter function. A total of 19 patients were offered minimally invasive surgical intervention for salvage of malfunctioning CAPD catheters (18 laparoscopic and 1 thoracoscopic). 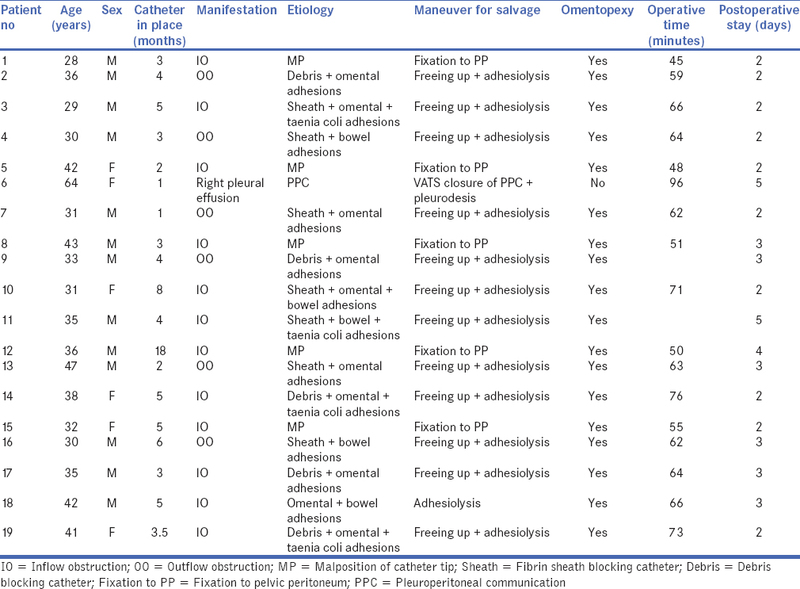 [Table 1] summarises the demographic data, the aetiology of malfunction and the manoeuvres employed for salvage, operative time and post-operative hospital stay in all the patients. In all the patients, a low volume dialysis was commenced on post-operative day 2 and full volume dialysis by post-operative day 10. None of the patients experienced intra- or post-operative complications including wound morbidity or CAPD peritonitis. At 6-month follow up, all catheters showed adequate function. Our experience confirms the utility and safety of minimally invasive surgical treatment in patients with malfunction of CAPD catheters from a variety of causes. CAPD is a commonly used alternative to HD and its advantages include better quality of life and less dietary restrictions. Catheter malfunction is common and very often reported shortly after insertion. The incidence may vary from 2% to 30%. Salvage of a malfunctioning catheter instead of its removal results in a functional rescue and prolongs life of the catheter, thus reducing the financial burden and patient morbidity. Although traditionally catheter salvage has required open surgery, laparoscopy has several advantages in terms of reduced post-operative pain, shorter hospital stay and convalescence. Catheter tips sometimes migrate to other quadrants of the abdomen resulting in suboptimal functioning. In our series, this was observed in 5/18 patients. Radiological manipulation often fails to reposition the catheter. In this situation, laparoscopy offers a simple solution, and this can easily be undertaken by surgeons with basic laparoscopic skills. We prefer to insert the first port by an open method away from the lower abdomen and place two additional 5 mm ports for a two-handed manipulation. In all our patients with a migrated catheter without adhesions, the catheter tip could be re-directed towards the pelvis and anchored to the pelvic peritoneum with a non-absorbable suture. Kumar et al. have described a novel method of suspending the catheter with two polypropylene sutures passed around it which were fixed to the lower abdominal wall, thereby maintaining the position of the catheter. Bae et al. proposed that this type of loop fixation is employed at the time of primary laparoscopic insertion and showed that the incidence of catheter migration was significantly lower with this strategy. Omental wrapping is another common cause of catheter malfunction and incidence as high as 32% has been suggested. In our series, it occurred in 9/18 patients. It has been suggested that as the adhesions above the level of pelvis do not interfere with catheter function, extensive adhesiolysis is not necessary. The omental adhesions to the catheter are stripped away, and those to the abdominal wall in the lower abdomen are sharply dissected with a scissors or an ultrasonic shears. This strategy minimises the risk of bowel injury, haemorrhage and re-formation of divided adhesions, which will eventually compromise the peritoneal cavity. However, only freeing of the catheter from omental adhesions is likely to result in a high rate of recurrent obstruction. Our preference is to perform an omentopexy in all patients who require salvage of a malfunctioning CAPD catheter. Goh has described a technique of ‘omental folding’ at laparoscopy. The distal end of the omentum was lifted up and pulled in a cephalad and medial direction towards the stomach and fixed to the gastrocolic part of the omentum with a non-absorbable suture. Others have described partial or complete omentectomy to prevent future omental wrapping. Although there are no data comparing catheter patency after omentectomy and omentopexy, in obese patients with a bulky omentum, it may be preferable to choose the former over the latter. Luminal occlusion with fibrin clots or encasing of the catheter with a fibrin sheath also plays a role in malfunction. Although the clots can sometimes be cleared with urokinase solution, till a laparoscopy is performed the mechanism of malfunction is difficult to determine. In 12 of our patients, fibrin sheath covering the catheter was peeled off. Adhesions to small bowel, appendices epiploicae or Fallopian tube More Detailss may be responsible for the malfunction in a small number of cases. The catheter needs to be carefully separated avoiding injury to the adherent viscera. Rarely, in patients' past, the childbearing age, a salpingectomy may have to be carried out to salvage the catheter. Our nephrologists resumed low volume PD in all patients on post-operative day 1 and commenced full volume dialysis by post-operative day 10. As suggested by Brandt and Ricanati, earlier initiation of dialysis may reduce the catheter re-occlusion as also the need of temporary HD. A recent update of the recommendations of the International Society of PD suggests a catheter survival of more than 80% at 1 year as a reasonable goal. Multiple studies have shown the success rates of laparoscopic salvage of CAPD catheters to be between 50% and 80%., In all our patients, the catheters were functioning at 6-month follow-up. One of the drawbacks of our study is the lack of long-term data on the catheter function as the patients returned to follow up with the respective referring units/hospitals. Recurrent pleural effusion is a rare complication of CAPD with a prevalence of 1%–2%. When the effusion develops immediately after initiation of dialysis, the presence of PPCs is presumed, whereas if this happens months to years later an acquired defect in the diaphragm due to increase in the intra-abdominal pressure is suspected. PD-related effusions have a propensity to affect the right pleural cavity, the cause of which is not known. The differential diagnosis of a pleural effusion in a patient undergoing PD is vast. Typically, patients with PPCs resulting in a porous diaphragm tend to demonstrate a high pleural fluid to plasma sugar ratio. Presence of a ‘sweet effusion’ is due to the presence of hypertonic, dextrose-based dialysate in the pleural cavity and differentiates it from other causes of effusion in a patient undergoing CAPD. A technetium-99m-labelled peritoneal scintigraphy or a CT with instillation of intraperitoneal dye (as performed in our patient) may sometimes be used to confirm the diagnosis. Temporary discontinuation of PD and thoracocentesis are temporary measures to manage the patients with this complication. As in one of our patients, thoracoscopic surgery not only allows the diagnosis of the small rents in the diaphragm but also their closure and pleurodesis to seal off the peritoneal cavity from the pleural space. In one study using a thoracoscopic approach, 88% patients successfully resumed long-term PD without recurrence. Minimally invasive surgery appears to be a feasible and safe alternative to open surgery for salvage of malfunctioning CAPD catheters. This modality likely reduces the chances of re-formation of adhesions and also ensures rapid recovery, reduced wound-related complications as well as allows for early institution of PD. Kimmelstiel FM, Miller RE, Molinelli BM, Lorch JA. Laparoscopic management of peritoneal dialysis catheters. Surg Gynecol Obstet 1993;176:565-70. Velasco García MA, García Ureña MA, Carnero F, Fernández Ruiz E, Remón Rodríguez C, Aljama Pérez-de-Lastra P, et al. Omental entrapping of the peritoneal dialysis catheter solved by a laparoscopic approach. Perit Dial Int 1997;17:194-5. Chao SH, Tsai TJ. Laparoscopic rescue of dysfunctional Tenckhoff catheters in continuous ambulatory peritoneal dialysis patients. Nephron 1993;65:157-8. Brandt CP, Ricanati ES. Use of laparoscopy in the management of malfunctioning peritoneal dialysis catheters. In: Khanna R, editor. Advances in Peritoneal Dialysis. Vol. 12. Toronto: Peritoneal Dialysis Publications; 1996. p. 223-36. Smith DW, Rankin RA. Value of peritoneoscopy for nonfunctioning continuous ambulatory peritoneal dialysis catheters. Gastrointest Endosc 1989;35:90-2. Cope C, Kramer MS. Letter: Laparoscopic retrieval of dialysis catheter. Ann Intern Med 1974;81:121. 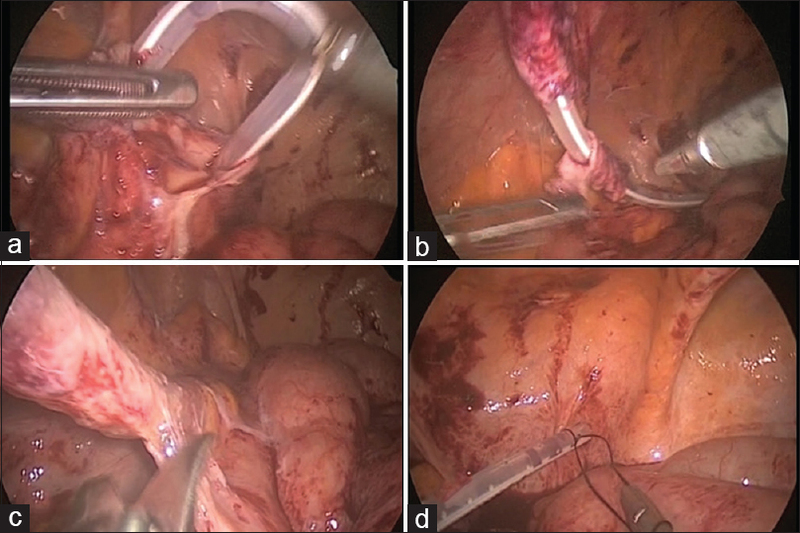 Kumar S, Singh S, Sharma AP, Rathi M. A novel technique for laparoscopic salvage of CAPD catheter malfunction and migration: The Santosh-PGI hanging loop technique. Case Rep Nephrol 2015;2015:684976. Bae IE, Chung WK, Choi ST, Kang J. Laparoscopic internal fixation is a viable alternative option for continuous ambulatory peritoneal dialysis catheter insertion. J Korean Surg Soc 2012;83:381-7. Crabtree JH. Selected best demonstrated practices in peritoneal dialysis access. Kidney Int Suppl 2006;103:S27-37. Goh YH. Omental folding: A novel laparoscopic technique for salvaging peritoneal dialysis catheters. Perit Dial Int 2008;28:626-31. Campisi S, Cavatorta F, Ramo E, Varano P. Videolaparoscopy with partial omentectomy in patients on peritoneal dialysis. Perit Dial Int 1997;17:211-2. Lee M, Donovan JF. Laparoscopic omentectomy for salvage of peritoneal dialysis catheters. J Endourol 2002;16:241-4. Moreiras-Plaza M, Cáceres-Alvarado N. Peritoneal dialysis catheter obstruction caused by fallopian tube wrapping. Am J Kidney Dis 2004;44:e28-30. Klein Z, Magen E, Fishman A, Korzets Z. Laparoscopic salpingectomy: The definitive treatment for peritoneal dialysis catheter outflow obstruction caused by oviductal fimbriae. J Laparoendosc Adv Surg Tech A 2003;13:65-8. Brandt CP, Ricanati ES. Use of laparoscopy in the management of malfunctioning peritoneal dialysis catheters. Adv Perit Dial 1996;12:223-6. Flanigan M, Gokal R. Peritoneal catheters and exit-site practices toward optimum peritoneal access: A review of current developments. Perit Dial Int 2005;25:132-9. Zoland MP, Loubeau JM, Krapf R, Zabetakis PM. A simplified laparoscopic salvage technique for malfunctioning chronic peritoneal dialysis catheters. Perit Dial Int 1997;17:610-2. Yilmazlar T, Kirdak T, Bilgin S, Yavuz M, Yurtkuran M. Laparoscopic findings of peritoneal dialysis catheter malfunction and management outcomes. Perit Dial Int 2006;26:374-9. Chow KM, Szeto CC, Li PK. Management options for hydrothorax complicating peritoneal dialysis. Semin Dial 2003;16:389-94. Chow KM, Szeto CC, Wong TY, Li PK. Hydrothorax complicating peritoneal dialysis: Diagnostic value of glucose concentration in pleural fluid aspirate. Perit Dial Int 2002;22:525-8. Tokmak H, Mudun A, Türkmen C, Sanli Y, Cantez S, Bozfakioğlu S, et al. The role of peritoneal scintigraphy in the detection of continuous ambulatory peritoneal dialysis complications. Ren Fail 2006;28:709-13.